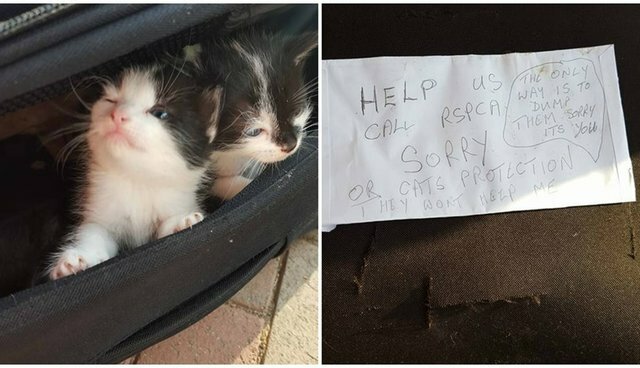 It's hard to imagine how anyone could abandon an adorable litter of kittens in a suitcase on the street - but that's exactly what someone did last week in Warrington, U.K. And whoever did it even left a note. Kaysie Sheridan was on her way to drop off her son Andrew at preschool on Friday morning when she passed a suitcase, tucked away near the school's entrance. Stopping to investigate, she discovered a litter of six tiny 3-week-old kittens along with a note reading, "The only way is to dump them sorry it's you." "Help us call RSPCA ... or cat's protection they won't help me," the note said. Shocked, Sheridan took the kittens to her mother, Sue, who has lots of experience caring for cats. "It wasn't very nice inside the case, and there was a cloth with blood on it, which we think the mother had probably given birth on," Sue Sheridan told the Warrington Guardian. After a checkup with a veterinarian and plenty of care, the kittens are doing much better - and the family plans to keep three out of the litter. "3 of them will be staying within family. myself my mum and my nana all will be having one," Kaysie Sheridan wrote on her Facebook page. "Though we do not want to promise homes to anyone at the moment as they're still very young." It's true that many rescues and shelters are full to capacity, but abandoning animals on the street is no solution. The best defense against pet overpopulation is, of course, spaying and neutering all our pets. "Whoever did this obviously wasn't in a position to look after them, but it's not nice what's happened," Sue Sheridan said. "I just look at them and my heart melts."